Thursday, April 8, 2004 at 7 p.m. The Quicksilver Mine Co. in Forestville will present a fascinating evening of poetic and architectural exploration with sculptor Bruce Johnson, poet Elizabeth Herron, and bookmaker Jimalee Plank, on Thursday, April 8 at 7:00 p.m. 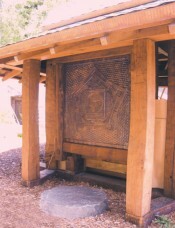 In 2001, Cazadero sculptor Bruce Johnson embarked upon a new project. Having dreamed for years about building a sacred space, he initially conceived of his new project as a teahouse. 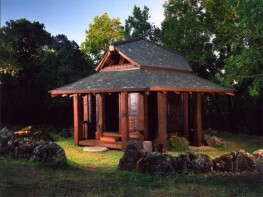 "A teahouse represents essential, everyday simplicity in harmony with nature," said Johnson. 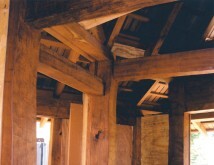 With the gift of an old salvaged redwood log, which he decided to use for posts and beams in the sacred building, he began work. Several years later, when the teahouse was well underway, he came upon an eloquent poem by Elizabeth Herron. He then realized that he was really building a "poetry housean empty space where attention resides." Heasked Herron to join him in the project. Elizabeth immediately accepted, even though at the time the nature of the collaboration was still a mystery to her. One day, without realizing it, she "transposed the words Poetry House into Poet's Housepossessive, personal, and specific. The writing took off," she said. 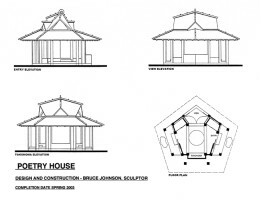 "I began a wonderful epic poem which I called The Poet’s House, paralleling Bruce’s beautiful sacred sculpture." The collaboration between Bruce and Elizabeth became complete when they were joined by bookmaker Jimalee Plank, a meticulous creator of hand bound books. The Poet’s House is being inscribed by hand into a beautiful book Jimalee has made especially for the Poetry House project. 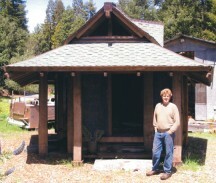 Bruce Johnson, an internationally known sculptor, has exhibited his work recently at the Paradise Ridge Sculpture Garden in Santa Rosa. His sculpture is also in permanent collections in Japan, Spain, and throughout the United States. Poet Elizabeth Carothers Herron is Professor of Arts and Humanities at Sonoma State University, and the author of many articles, collections of poetry and a book of short fiction. Jimalee Plank creates handmade and hand bound books for artists, poets, and writers. This evening at Quicksilver, Poetry, Architecture, and Handmade Books, will include a photographic presentation on the Poetry House by Bruce Johnson; a reading and talk by poet Elizabeth Herron; and a special demonstration and display of handmade books by Jimalee Plank. This event is free and open to the public; seating is limited.